22x15, 300 yards down the road. My friend Julie Galeeva has a gallery here in Makawao and she is painting with me and her son Nikita. My panel is smooth gesso on a hot pressed masonite panel, first a charcoal outline drawing which was painted over with paint, no color yet. An accurate drawing is my framework and worth the time invested. I'm painting too close to the traffic. Big trucks move the painting, but I like the view. Because there are so many blossoms on the ground I figure the tree is at it's prime and going down. I chose a 15x11 panel. If I had started 2 days ago I would have chosen a 22x15 panel. Day 1, 3-2-12, 12 to 2am, Acrylic Colors: O.H. Indian yellow clear (monotone), O.H. Indian Yellow Org/side, O.H. Indian Yellow Brn/side, orange, red, trans magenta, trans purple, ult. blue, cobalt blue, trans cyan, trans green yell/side and opaque yellow-green. The colors are local highlight colors, at this point I'm working in patterns. That ended this day. Here it is after I washed off the charcoal. Day 2, 3-4-12, 9 to 10:30, The sun left so I left. With 100% paint coverage I'm 1/2 way finished, but, architecture takes longer. Today there was another chemical arial spraying, this time it was behind me so I didn't include it in the painting. Day 3, 3-7-12, It's been raining lately but today was perfect. Up a 7:50, on the road 8:12, arrive 8:25, sun shining, quickly, quickly, I set up. The tree lost a little of it's brilliance but was still almost full. I got all my colors and shapes in so another sunny day is a blessing. I toned down the tree and re-did the main branches. The fence and road took shadows, it's well on it's way. 10:00 is when I noticed the sun and clouds coming. I packed up and headed out, two minutes down the road it was raining, all the way home. Tonight we have a sign waving for Ron Paul at 4PM. This is going to be a very busy day. 3-9-12, I was up at 7 Am but it was a cloudy "no go". The sun didn't come out until 10 AM, that's the time I want to leave the painting and just catch the morning light. It's been windy and it rained a lot yesterday, that means a lot of flowers will be blown off :( I hope tomorrow is a good day for the painting. Julie and Nikita have moved their time to an 11 AM start and they got to paint today. Day 4, 3-10-12, It was cloudy again this morning but I went our when the sun came out, 9:30 AM. I figured I could get some shapes in and stayed until 11:30. 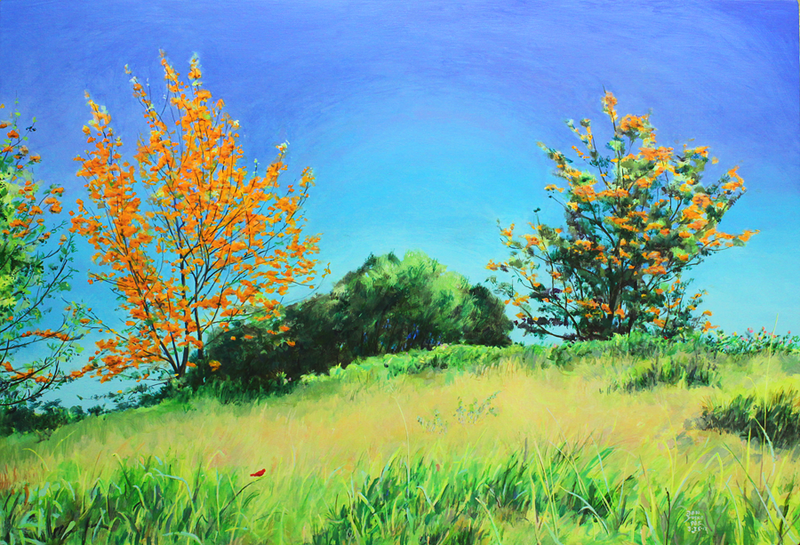 Day 5, 3-11-12, It was a perfect day for my painting, I got there at 7:45, the sun was perfect. Last night I saw the four planets in a straight line, it's happening! Yesterday, you know how much money Obama has put into Arizona, opening up the border, voting without a picture ID, money being spent he doesn't have, he want's to bankrupt us and bring in the world government, he wants Mexico, US and Canada to be like Europe, one union, the North American Union. Well, yesterday Ron Paul got every one of Arizona's delegates to the Electoral College. Things are changing fast. And as far as Georgia is concerned, Obama gave them two nuclear plants (which we all voted against 30 years ago) to put him back on the Georgia ballot. Obama doesn't have the money, he has us 15 trillion in debt, he wants us bankrupt. I say Georgia isn't going to have any nuclear plants, not with my new money. Go Ron Paul and thanks Sheriff Joe, for documenting the proof we needed. One more day for touch-ups and this painting will be finished. I noticed the camera's image number was 1200 for this picture today, I'm smiling. Day 6, 3-13-12, Finished. 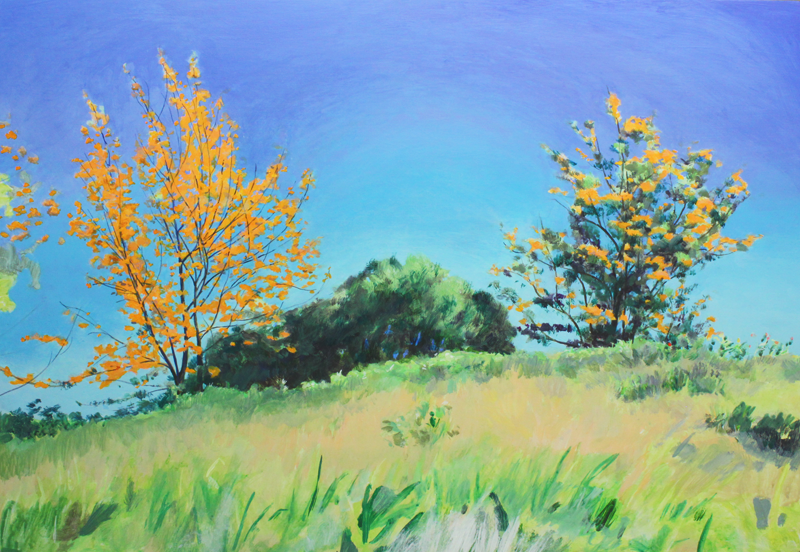 It was a great for painting, the sun was shining when I got here at 8 Am and stayed that way. I finished #984 at 11 Am. 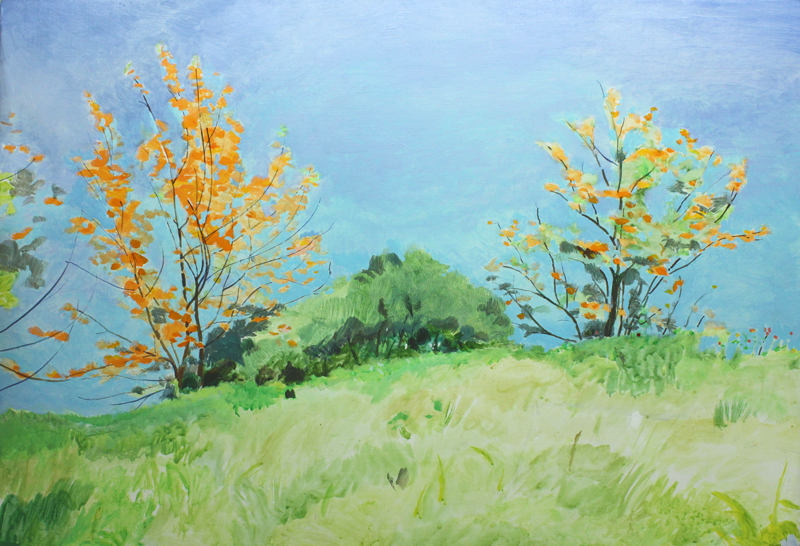 Day 1, 3-13-12, While driving back home after finishing the Jacaranda painting I saw this bright orange Silver Oak Tree, and because I now had 'clarity' :), I stopped and started a new painting. Starting with this smaller Jacaranda 15x11 painting was good, after all I was out of pactice. This one is a 22x15, the next one should be a 30x22, the last one was a 7.5x5.5 Yellow Shower Tree. It took an hour to draw the silver oaks in, I started painting at 12 PM or there abouts, I forgot to look. Ended at 1:40. 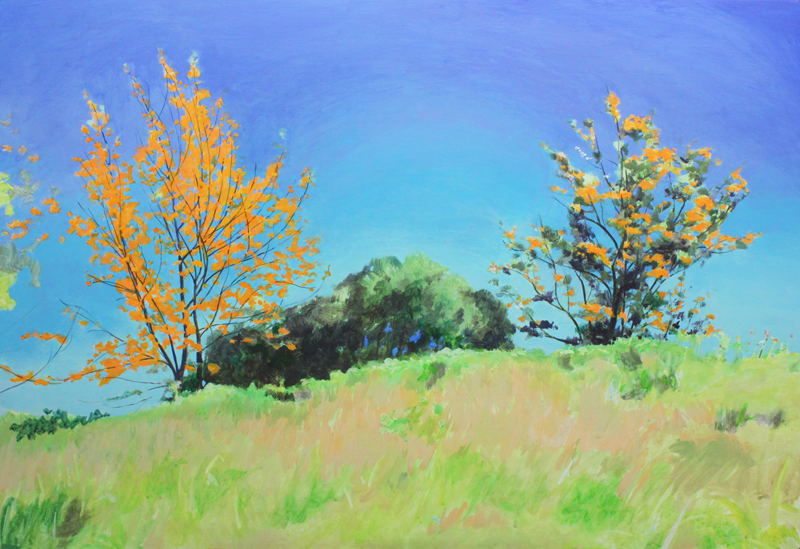 The tree changed from orange to yellow-orange, I want the orange so I think this will be a 10 to 11 painting. The big shadow in the middle ground center bush was gone, but the sky still was from cobalt blue to cyan and clear. Day 2, 3-14-12. Started late, 11:30, Stayed late, 3:00. The last hour didn't count, I had whited out the areas that were sky and were the wrong color and colored them in. Today I just added the branches and got the oranges a little closer to what I'm seeing. Painting a tree is a lot like doing a portrait, you need a good underdrawing and have to be aware of the shapes. It can be done quickly but I prefer a slow detailed painting. When I really paint fast I prefer a medium that really appreciates it, like water color. Especially if I'm doing it with out any pre-drawing. No mistakes, no going back. Bold color more vibrate than what I see because the colors dry lighter. Acrylics on the other hand dry darker. It's the acrylic white added to tint the color where water colors just use water to tint with. The oranger color is not going to happen again. It's about complements, with a clear dark ult. blue sky the orange in the tree is yellower, the sun is bright. I'm also getting a hazy sky that is not bright enough. I'll try at 10 Am tomorrow. Day 3, 3-15-12, 10 Am on location. Yes! I have the orange. Now the complements are the stronger Cad Orange and Cobalt Blue. Tomorrow our living complex has bingo at 9 am so I won't be on location. If I miss another sunny day of painting I'll be upset, two in a row was nice. the next painting day I plan on be out there at 9 am and the painting will be color set. The tree's main color is Cad Orange, Cad Yellow Med and white mixed. The shadow on the big bush is good, the sun is behind the tree. 10:45, Clouds are moving across the sky now, I think I want the clear sky. All the orange is brought up to date, it's 11:37 and I'm applying white to the new areas for orange color. 12 noon and I'm finished for the day. Next time I'll start at 9 Am and work until 11 Am on the painting, my time is set. 3-18-12 and I still haven't been able to get out to the location. I have done some off location work in the sky, I have the colors I saw and am applying them with my fingers. Getting smooth blends with one brush is very difficult in acrylics. Painting with fingers makes it hard to get outlines and fine details. It's nice to have a sink handy or a bucket of water and a bottle of ammonia. I hope tomorrow proves good light. No photo today. Tip: The easiest way to get a sky blended is to do it first and draw on top of it with white chalk and white out the areas that are not sky. Day 4, 3-19-12, 8:45 on location. There is a slight rain this morning as I look out my window, it's probably clear 10 minutes away on location. I'm going anyway because it's been a week since I started and a tree can change a lot in a week. I have to get the branches in and I can do that rain or shine. 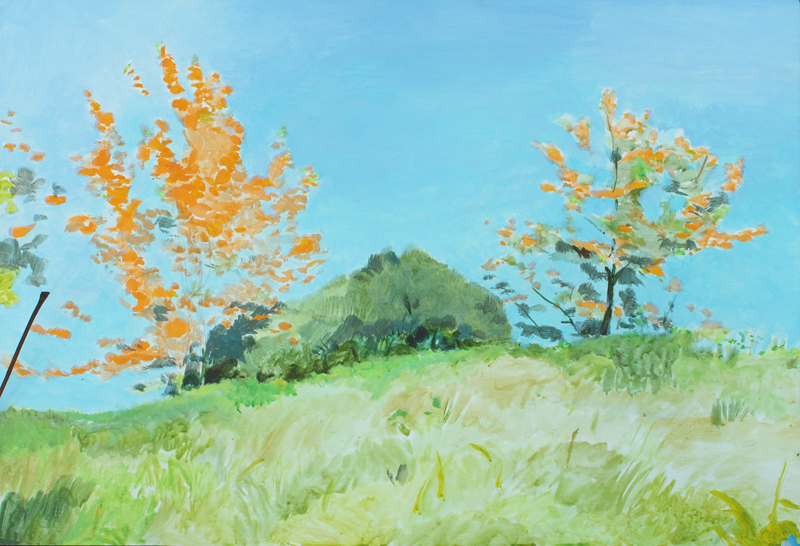 When I got there I noticed some of the orange was turning green, or maybe the green leaves were just growing, anyway it wasn't all orange like I'm painting it. It didn't rain, that's good. The sun came out at 11 AM but I want earlier colors so I left. I got the branches in on both trees, darkened the sky and filled all the white spaces between the flowers and sky. I hope tomorrow's sunny, it should be, it's been clear all afternoon and night. Day 5, 3-20-12, 8:45 on location. A perfect day. 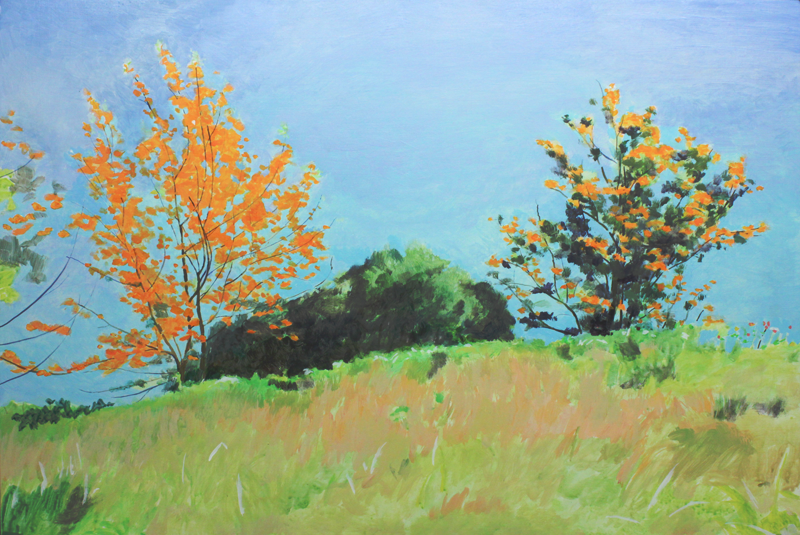 I started giving the trees form, shadowing the orange flowers with a mix of cad orange, bt. Sienna and white and adding the shadowed flowers. That's what I'll do tomorrow, and finish up the foreground weeds and part of another silver oak in the left foreground. Tip: As orange darkens it first goes to an burnt Senna hue, than to bt.umber, then adds the opposite color cyan to get black. As it tints naturally orange adds yellow. This is separate from the tint palette which only adds white like the RGB color space, RGB also only adds black to shadow colors (by subtracting light). Day 6, 3-21-12, at 7:00 the sun was shining, by the time I got out of the shower it was overcast, by 9:00 when I was to be on location it was pouring. If it clears up by 10 I'll go. 9:30 it's completely socked it in, this day is shot for this painting. Luckily I have 4 others to work on. 10:15, the rain stopped but there is no sun. 10:40 the sun came out and I took off in a flash. 10 minutes driving, 3 minutes setup and I was painting. I got the some silver light green leaves on the left tree and the branches of the left foreground tree and a little on the weeds in front. It was 11:15 so I stopped. The main trees are finished and today the solid orange tree is a different tree, it's not solid orange anymore. 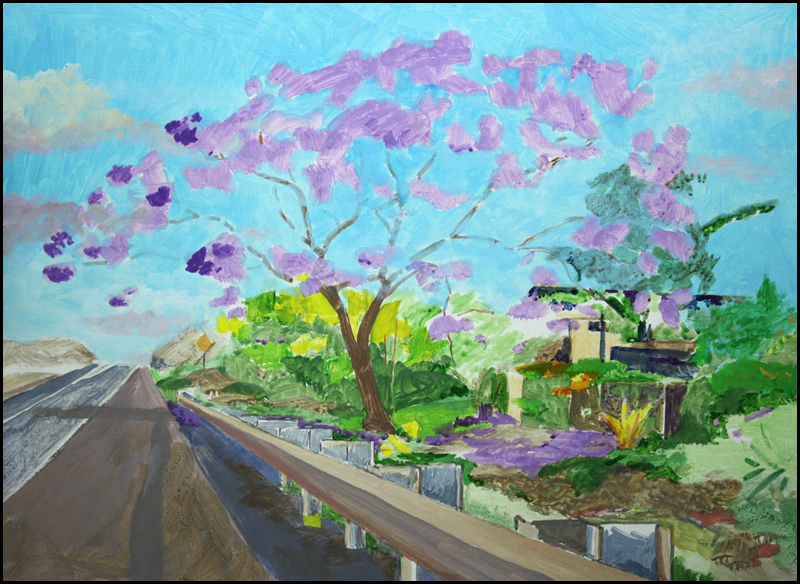 When I got home I worked on the daytime yellow shower tree painting, the flowers were gone now and I couldn't see over the foreground oleander bush so I moved up to the third floor were I could see the parking lot. No photo. I finished # 982, the Daytime Shower Tree. Actually it was just the red car that wasn't finished and the guy doesn't work there anymore. I'm glad to get that one out of my hair. Day 7, 3-22x-12, Raining at 7 Am, raining 8:45 but just a little so I went. 9 Am on location and it's sunny. It was a great day. A cardinal landed on a reed and I painted him in. One more day on the foreground should do it. Day 8, 3-23-12, Drive 8:25, arrive 8:35, one minute to setup. 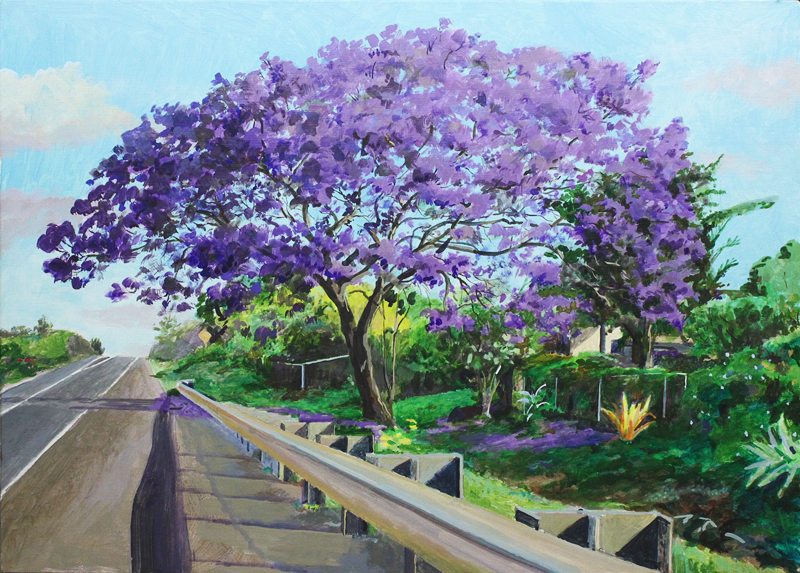 My palette has stayed wet since the last jacaranda painting, I spray it with water twice a day. 9:30 is the perfect time for colors in this painting. Tip: you can wet remove dry paint in layers. Once in very wet Nahiku I removed three layers down one at a time by just continually rubbing the area wet. One more day on the foreground, Ha, it always goes that way. Because of all the rain the grass was turning greener right before my eyes. Now that I was concentrating on the foreground I see the center small foreground bush is too far to the left, white it out, color it in, add the new bush. The weeds have the sky reflection on them, that's what all the light blue strokes are for, first white then light blue. 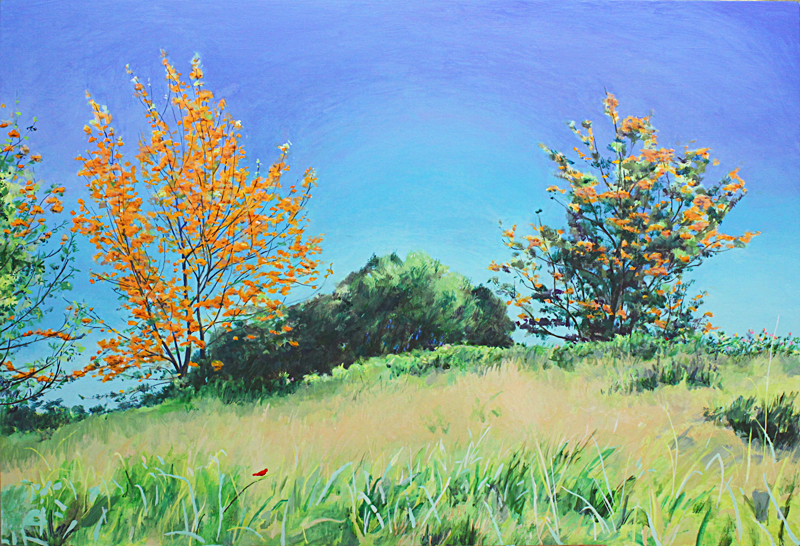 The right tree was too bright so I toned the flowers down with a thin wash of white and cyan. I left at 11:10. Day 9, 3-25-12, Finished. Arrived at 9:14, stopped at 12:30, I left Makawao in a sun-shower and arrived in sunshine, and it stayed that way until I signed it. The whole 3.5 hours was spent on the foreground. The day I started this the tree was in it's full glorie. 100% flower with no leaves. From here on green leaves will start growing. I suppose the day before would have been perfect also. It takes plenty of rain for a week, then rain at night and sun in the daytime for a week. 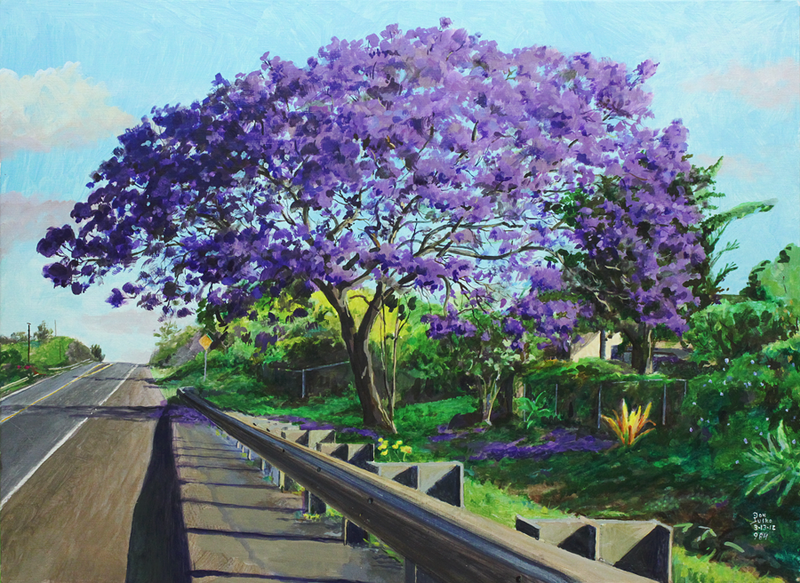 This was the brightest silver oak on Maui, just like the last painting was as bright (the only jacaranda blooming) as any jacaranda I had ever seen. It's been a very good season so far. Down the road is a blooming African Tulip tree that is bright red, a red usually reserved for the Royal Poinsettia tree. the only problem is it's in a terrible painting location and I'm not happy about a telegraph poll and wire in the middle of the tree from the only viewing location. 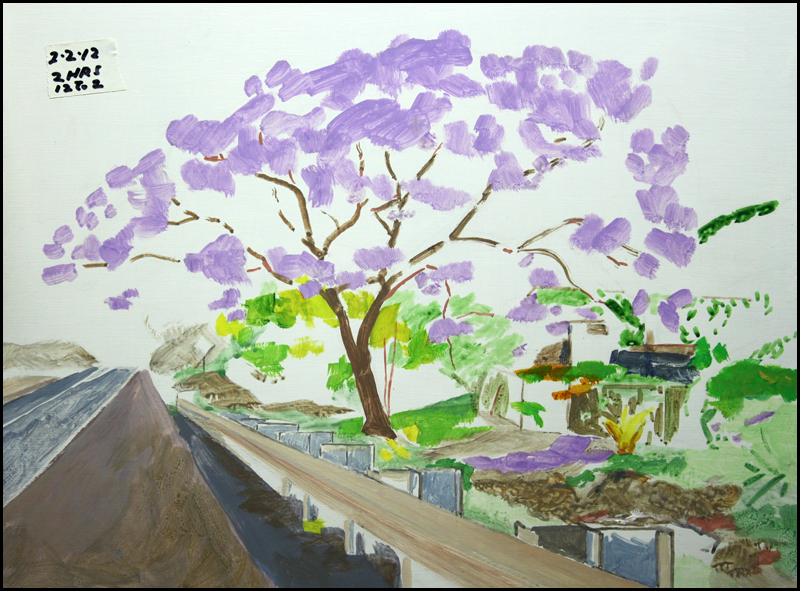 I would like the color red after first painting a yellow shower tree, then a blue-purple jacaranda. 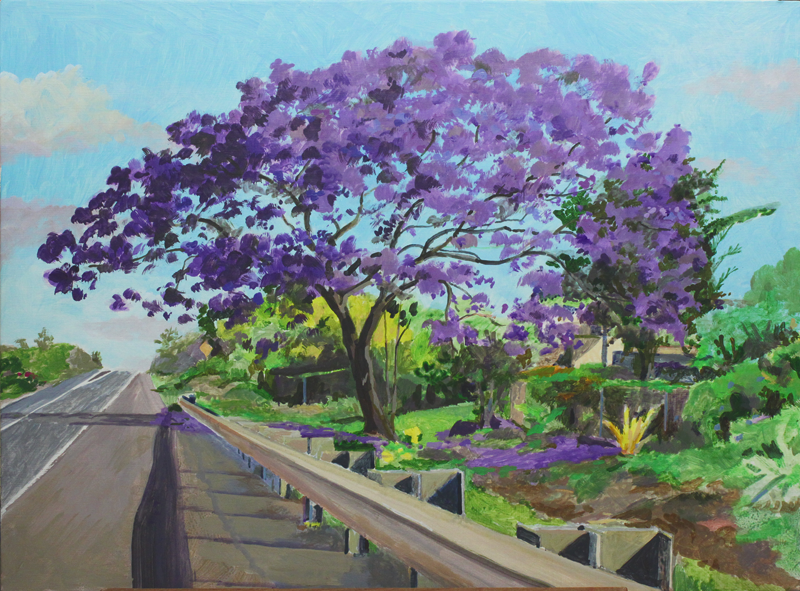 The other choice is another jacaranda next door behind the Post Office, they are hot right now, I started a W/C yesterday at noon. Tip: As my artist friendTom Booth say's, "keep a rag handy". It's not just for accidents but also for erasing. I can put down a stroke and wipe it off if I don't like it, it's really easy if your undercoat is dry. The brush I used for the finest lines was a Utrecht Ser. 229, #1, Sablette. I got it because it has a flat end and I like flats with a round ferule. My favorit is 7/16" wide and 15/32" long. It's a no wimp oil sable brush and I can get into any corner, it's my finishing brush. The next larger brush is 9/16" long and 1/8" wide sable and it's a workhorse. You can see the shimmer of the little light green leaves on the end of some branches. That's where it got it's name, "Silver Oak". The last step was to wash with Indian yellow Tartrazine pigment that I made myself. The darks stay brillant and the lights take the tint.